Guy Coates’ A3 sheets are legendary. Covered in scribbled pencil and eraser marks – the figures are almost illegible. The long-time rancher, originally from Montana, USA, would lay them out on the coffee table at his Waipuna cattle station and try to figure out how to grow his business. His yearly budget and forecasts laid bare, Guy’s accountant Ben Gilmour, from Moore Stephens Markhams Hawkes Bay, could see the hard work he’d put in. But Ben knew immediately that this paper-based system was slowing things down for the Coates family. 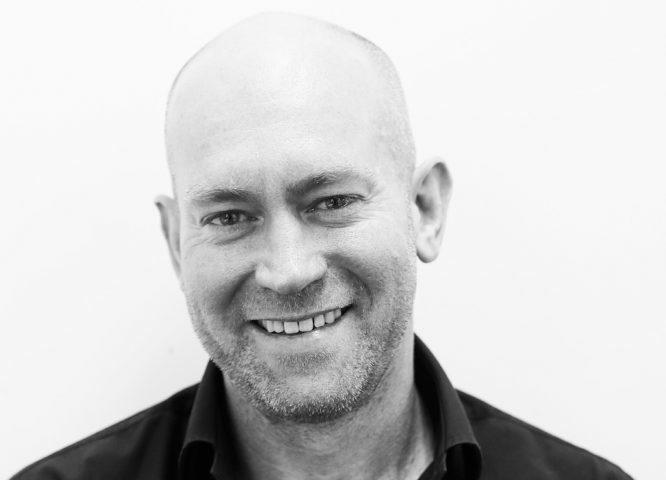 Rounding out Guy’s financial team alongside Ben was Chris Lamb from ASB Bank. The trio were itching to grow Guy’s business and ditch the cumbersome A3 sheets. “Also, having done the budgets on paper, you didn’t want to change it, ever! Change meant hours of work erasing all of those figures and putting in new ones. [Having a paper-based system was] really a disincentive to try and be creative with your budget, take on risks, and grow. It was easy to just keep doing things the way I had always done it” Guy recalls. Communication is just key, and the basis for that is the information we need to make the right decisions. The fast lane of technology, with cloud-based systems like Xero and Figured, was something Chris Lamb, ASB’s rural manager in the Hawkes Bay and Guy’s banker, was always working to keep on top of. Having worked in rural banking for more than quarter of a century, he’s seen a lot of technological change in the farming sector. “We didn’t even have computers when I started,” says Chris. “Farmers have literally gone from writing figures on the back of cigarette packets to Xero and Figured in 25 years!” he laughs. A major shift for the team has been to how they go over the annual review. “[Before Xero and Figured] It was like driving forward and always looking in the rearview mirror,” says Guy. “The hardest part is getting their [a client’s] buy-in,” says Ben. “People don’t like change. If they’re using CashManager, say… even if they’re not using it properly, they’re scared of moving to something else. For Chris and ASB, the access to real-time data and information that Xero and Figured provide have been the biggest changes to how he manages his clients. “I love information. My job is so much easier because it’s all there, any time I log in [to Xero and Figured] at any time of the day. I don’t have to pester Guy or Ben and demand information, because it’s all there online,” says Chris. Which means no more A3 sheets of paper laid out on the coffee table. The post How a Hawkes Bay cattle farm’s operation moved online appeared first on Xero Blog. The post PC Magazine labels Xero the fastest accounting software innovator appeared first on Xero Blog. 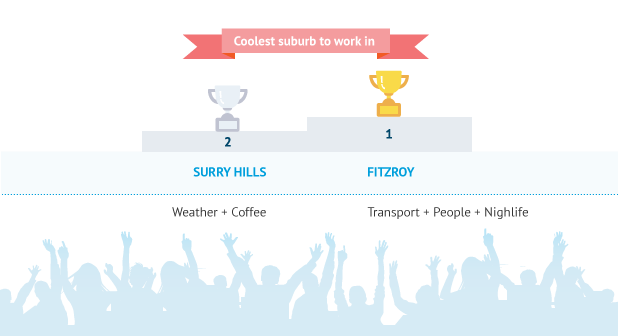 What makes a suburb a cool place to work? …which is a roundabout way of them saying that a cool place to work is determined more by lifestyle options than ‘work’. Or maybe that they’re hipsters (even though they hate that word). Winner: Not surprisingly, the sun shines on Surry Hills. Despite the cooler weather, Fitzroy hipsters get around on fixies, which makes sense because the wide streets and hardly any inclines (compared to Surry Hills) are perfect for cycling up and down to the nearest lunch spot or vintage store. Winner: Fitzroy by a mile, because it doesn’t have the mountainous ranges of Surry, making it ideal for walking or cycling. Plus it’s well-served by trams for lazy days. Coffee and food will always be important in any work day and in both neighbourhoods you’re spoilt for choice. Like Fitzroy, Surry Hills has been a hub of great coffee and food for as long as anyone can remember. 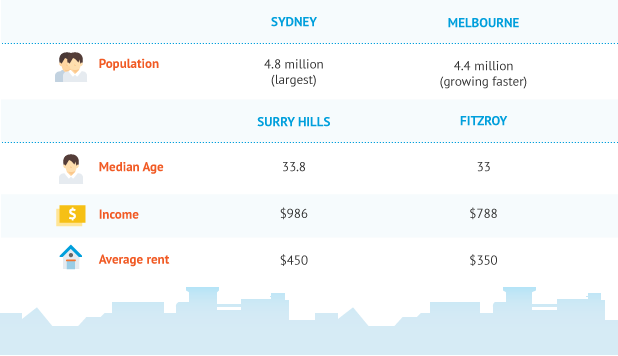 “Historically it is the best suburb in Sydney to find whatever hospitality you’re looking for. If I had to choose one suburb to go for a night out it would be Surry Hills.” says Yulli’s owner Chris. One debate that’s ongoing is the coffee scene in both these cities. 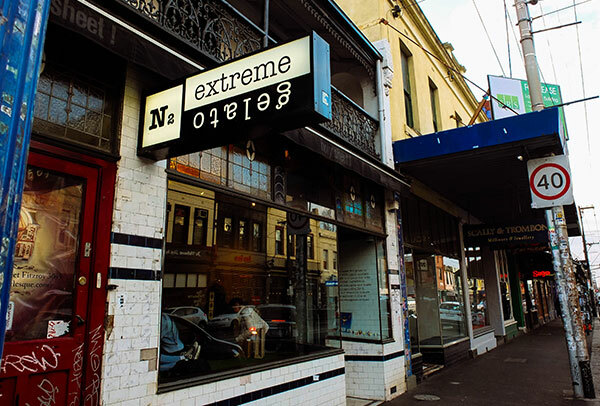 While Melbourne is known for its world class coffee, not everyone agrees with the hype. 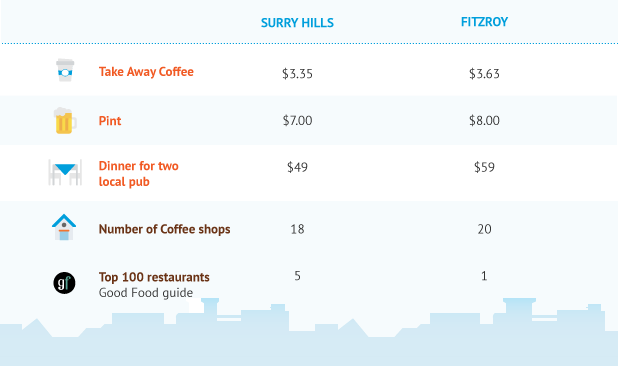 Surry Hills has more ‘award-winning’ coffee roasters per square kilometer than anywhere else. “I think Sydney coffee is definitely better, the coffee is too weak in Melbourne,” declares Josh, from Cali Press in Surry Hills, who supplies the suburb with fresh, healthy food and drink inspired by the clean living trend in California. Winner: Surry Hills because there’s more drip coffee to go around. “You meet a lot of young professionals during the week – a real mixed bag of fashion, music and other creative types – and on the weekends the locals get to rule the street again. There might be a big terraced house with 4 or 5 uni students living in it. Winner: Fitzroy because the rent is more affordable and therefore more young people can afford to be there. After dark Fitzroy’s and Surry Hills’ vibrant mixes of restaurants, bars and pubs keep their local economies pumping. 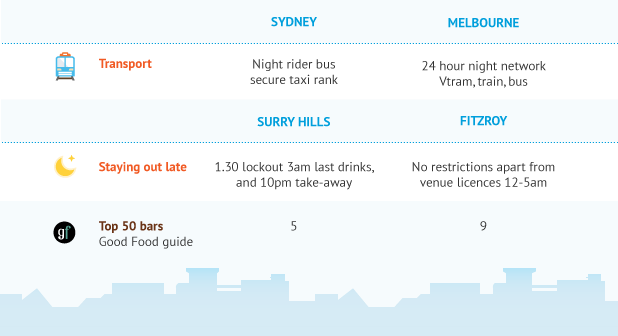 Sadly for Surry Hills, Sydney’s lockout laws have almost killed the late night vibe. Winner: Fitzroy because you can choose your own bedtime. It was a close race, but I have to call it. While Surry Hills might have better weather and more hipster drip coffee, Fitzroy has youth on its side, cheaper rent, and a political climate that supports a city that never sleeps. The post Coolest suburbs to work: Fitzroy vs Surry Hills appeared first on Deputy. When it comes to making a big decision in life, doing your research and shopping around is usually how you would guarantee the best outcome, right? Well, yes… except for when you’re shopping around for credit. Now that Moula can lend up to $250,000, you might be thinking of taking out a loan to grow your business. This could be for a big stock order, to purchase equipment or hire a new staff member. There are dozens of loan providers out there, and it definitely makes sense to be armed with as much market research as possible, to compare rates, and find the right product to suit your business. And as with any other big financial decision, you’ll want to understand the terms of the contract, be confident and comfortable that you understand the repayment terms and your ability to make the payments, and of course read any fine print. When it comes to comparing credit providers, it’s not always so simple. In Australia, credit enquiries – where you have approached a lender and asked them to consider you for credit – will almost always result in a “credit enquiry” on your business and/or personal credit history with one of the main credit bureaus (the most well-known being Veda and Dun & Bradstreet). Okay, so what’s the problem? whether you have been shopping around for credit (credit enquiries). Typically, the more shopping around, the lower your score, and the less likely you are to obtain finance. For many small business owners who don’t know how the game works, you end up shopping around some more, and lowering your score even more. Soon enough your business is locked out of the funding market altogether. So, what should you do if you want to shop smart? First of all, look for transparent lenders who publish their interest rates online. Second, when applying for credit, ask the lender if a credit bureau enquiry will be conducted. If there’s a low chance of getting finance, consider pulling your application before a credit check is run. 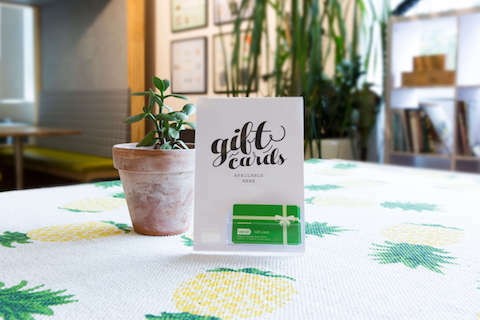 Shopper beware: So many good businesses conduct Credit Kamikaze on their credit bureau score, as they’re not aware of the link between credit enquiries and credit score reduction. Don’t be one of them! 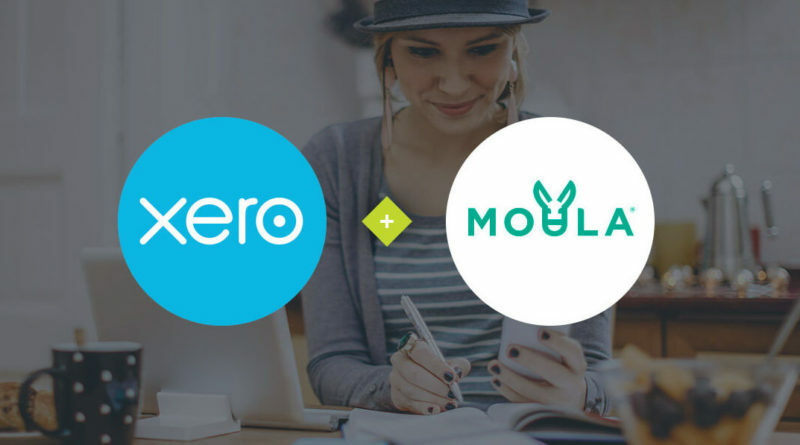 As a Xero customer, Moula will extend a saving of between 2.5% and 5.0% off their standard APR. Visit Moula to learn more about how it works with Xero to help you grow your business – with no hidden fees and no hassle. Before becoming co-founder and COO of Moula, Andrew spent over 16 years with a number of financial institutions in London, spanning risk management, credit modeling and structuring. Now that he’s back home, Andrew is focused on solving the capital problem faced by small businesses in Australia. He has a Bachelor of Commerce from the University of Melbourne and is a Chartered Accountant of Australia. This article originally appeared on Moula.com.au. The post Beware the Credit Kamikaze appeared first on Xero Blog. 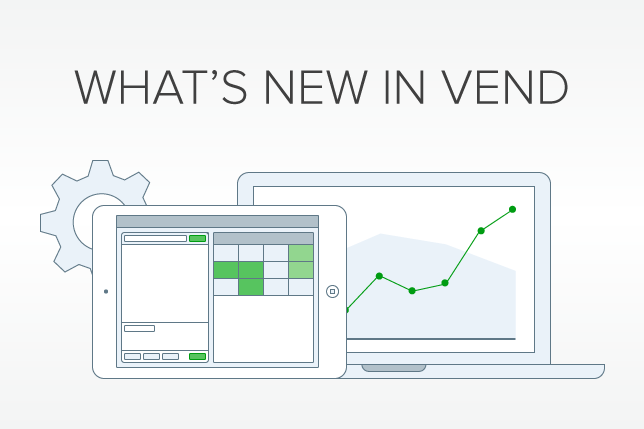 The post What’s new in Vend: July appeared first on Vend Retail Blog. Creative marketing and accounting, how can they possibly go together? But they do! As a small business owner myself, prior to my accounting training I had a perception that my advisor was only someone that I would see once-a year for my taxes. But now, after accounting education and a lifetime of running practices, I realize that accounting is simply a product that requires marketing just like anything else and one that unfortunately gets put in the “too hard” basket. As accountants, we don’t really get a lot of training and experience in that area. Let’s take one example of the services we provide and how we can implement some marketing principles to amplify the importance of that service or product. Bookkeeping is a vital part of the accounting cycle and one that a lot of small business owners fail to realize needs to take place before they can get the important advice from their advisor about what is going on in the life of their business and also the unavoidable process of compliance and payment of taxes. What a lot of business owners do is essentially put the cart before the horse – they get things around the wrong way. This then makes it costly for them as the accountant or bookkeeper is backtracking and putting transactions in the general ledger often in a rush to meet compliance deadlines. The small business is presented with a large bill for important time spent and then often doesn’t see the value in investing further to get the advice that is required to allow them to make informed business decisions. It becomes a vicious cycle, and not one that is facilitatory to a trusted advisor relationship. And let’s face it, this is the type of relationship that is most valuable to a practice, it builds asset value for us as well as maintains a healthy cashflow cycle. It seems like it would make much more sense to take some time to educate the clients on HOW to keep their financial information in a systemized and automated process during the year. Yet a lot of small business don’t understand WHY they need to do this. As accountants and bookkeepers providing the bookkeeping service, I believe that the road to success in educating this important function to business owners, should be very much part of our continued messaging, and form the foundation of our brand positioning statement. Connecting with your prospective clients up front with this message, sets the expectation for the types of clients you want to attract and maintain. Brand positioning is all about you positioning your product into the market segment for clients who want high quality, competitively priced services. If a smaller firm tries to compete solely on price, it may not survive as bigger firms can use their size to drive down costs. I would love to hear your brand positioning statement in the comments below! The post Why bookkeepers need to think about more than just the numbers appeared first on Xero Blog. 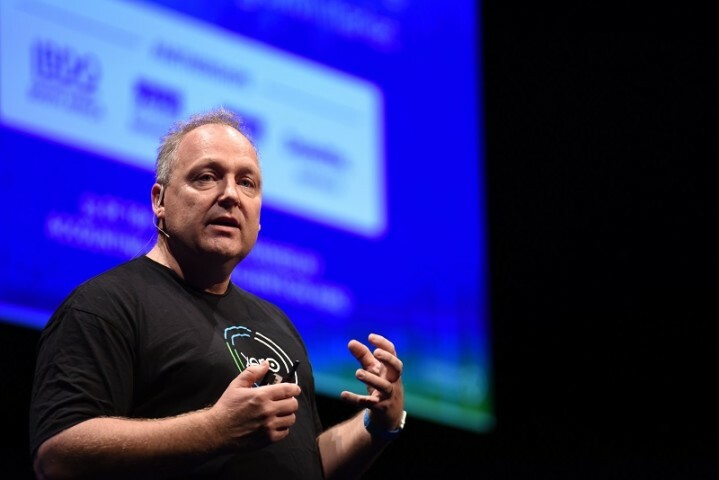 Xero is leaps and bounds ahead when it comes to small businesses’ digital security, offering step authentication, to help keep your financial data secure. Xero Americas CMO, Paul Miller, says receiving such a strong validation from PC Magazine demonstrates that the cloud accounting company is gaining in the U.S..
It’s the end of July, and while vacation goers are enjoying plenty of waves at the beach, back in the office, Deputy is making waves of our own. Last week, we were recognized as a Category Leader in two separate categories in GetApp’s Q3 Quarterly Ranking Report – taking home top honors for both Workforce Management and Employee Scheduling. Integrations: Running a successful business and maintaining a prosperous enterprise is hard enough. Therefore, business owners and decision makers shouldn’t have to rely on a different solution to run every aspect of it. Deputy integrates with an ecosystem of over 35 applications and services, including Gusto, ADP, Quickbooks, and more. In return, we are able to provide our 25,000 customers across the globe with end-to-end business solutions in payroll, point of sale and project billing – straight from their mobile device! Security: We recognize that our customers put their trust in us to provide a secure, stable platform for their business. That’s why we utilize leading technology and practices to manage the security and integrity of data for each customer. This ranges from offering the same level of encryption used by online banks to three layers of application security as customers’ login to Deputy and even WhiteHat Sentinel penetration testing in order to safeguard our customers’ data from breaches and hackers. “Deputy gives me the time I need to be there for my customers and grow my business. I love Deputy’s intuitive, easy-to-use platform and its ability to integrate with my existing business software.” – Derek Belnap, owner of 3 Cups. Hearing the impact that we are making in our customers’ lives only motivates us further to continue to provide an innovative, top-of-the-line solution. Want to see how we can make an impact on the future of your businesses? 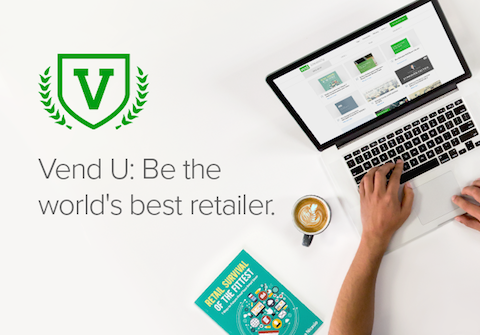 Sign up for a free trial and get started today. The post Deputy Ranks #1 in Two Categories in GetApp Quarterly Report appeared first on Deputy. Graduating from university and knowing where to head next is an uncomfortable reality many students are about to face. If a graduate role can’t fuel your passion perhaps taking the entrepreneurship route and starting a small business might. Here are some important things to remember for starting a small business as a grad. Nowadays there are only roughly five things you will need to start a small business, they are a computer, a reliable internet connection, a bit of start-up cash, some brain power, and a hell of a lot of drive. Although starting a business will be a struggle to begin with there’s one important thing to remember you have on your side. That’s the time and energy you need to fully devote yourself to your business, without the distraction of a spouse, kids or an existing job. Long work days and lack of sleep won’t have as much as an affect on you, because you are already used to staying up late to cram for an exam, but still manage to make it to your 8am lecture the next morning. In addition to this your personal expenses are minimum, besides food, rent and the odd bill, as you aren’t supporting a family, or paying off a mortgage. This means that revenue can stay inside the business, helping it to grow faster. You must ask yourself if the benefits of working for yourself outweigh the burden. It’s important to remember that when starting out you are everything, from the sales team, to the marketing department, as well as billing and collections, to the receptionist. Essentially you are every aspect of the business, until it has grown enough that you can start hiring. You also mustn’t forget that starting a business doesn’t lead you to instant success. It will take time before the business starts earning revenue and you can afford to send yourself home with a paycheque. All this being said, starting a business gives you a real experience that only others who have been down the same path can understand. Nothing makes you value a customer more than the struggle to acquire one in the first place. If it seems like the right route for you, then we say go for it! With Kiwis leading the way in terms of innovative ideas and thinking, and small businesses making up 69% of the economy there is literally no time like the present to take that leap! The post Things to think about when starting a small business as a grad appeared first on Xero Blog.